or miss her particular talent. Marie’s son has confronted her with evidence that he might be a year older than it says on his birth certificate. In the 21st century, who cares? Marie does. Set in a speakeasy in Harlem in the 1920's, Sylvie Song is about the power of the blues. with herself, her faithless lover and the self she longs to be. A woman struggles against the tides of his life. When the world gives you oranges, you make apple juice. their wedding hangs precariously in the balance. Bob Rogerson last directed for WCT in October 2015, the reading of Angelo Parra’s full-length drama, The Mnemonist. His directorial experience covers the range from amateur and university stages (Canvases/42nd Street BlackBox; Comic Potentia[SF1] /Newport News;) to professional venues (Shell Shock/NYC; You’re A Good Man Charlie Brown/Boston; and Bob’s own adaptation of Twain’s musings to create Adam & Eve (As Seen RThrough the Pen of Mark Twain) to name just a few. Rogerson is one of the founding members of The Actors’ Process, an actor’s continuing study program, addressing the work of professional actors. As a proud member of AEA and SAG-AFTRA, Rogerson has worked in almost every medium of the entertainment industry, including stage, screen, and television. Natalie Bates began her career as an actress, working successfully on stage in New York and Chicago, and in film in Los Angeles. She returned to the theater as a playwright, starting with a three-act drama about incestuous child abuse, These Things Happen. Many of her projects, including Miracle on I-84, The Best of Friends, Always, and Overnight, were developed in the HB Playwrights’ Seminar. Other productions include a Gallery Players presentation of The Game in their Black Box Festival, and in 2015 the Fresh Fruit Festival presented a production of her new play, Telling, a tribute to two unlikely pioneers of the marriage equality movement. Linda fell in love with theater over 25 years ago and soon discovered that her favorite role is playwright. Her WCT credits include “The Reveal” at the Living Art event and “The Spoiler” at last summer’s short play readings. Prior to joining WCT, she resided in New York’s Capital Region where her works for adult and family audiences were widely produced. She is a proud member of the Dramatists Guild of America and grateful to WCT for providing an opportunity to develop plays with the assistance of so many talented collaborators. Carol has developed a number of plays at the Westchester Collaborative Theater including Bent Wings, Road Kill, A Different Kind of Beauty and Shadows & Light which was a finalist in the 2016 Aery 20/20 Festival. Many thanks to the WCT and it's members for encouraging original work and providing a cool new space for performance. Evelyn Mertens has had one-act plays and monologues produced through Westchester Collaborative Theater (WCT); Axial Theatre’s Life on Earth, Gaslight Tango, Twisted Valentines 2015 – 2017, Glass Ceiling Breakers, and several Performance and Monologue Workshops; the 20/20 Aery Theatre Festival where she was twice a finalist; Irvington Town Hall Theatre’s Stage Door series; Manhattan Rep; and John Chatterton’s Short Play Lab. She studied acting through Howard Meyer’s Acting Program through the Master level, the American Academy of Dramatic Arts and Circle in the Square. A principal and owner of QED Associates LLC, Evelyn is a PR specialist and writer for a variety of private and nonprofit clients in theatre and the construction and design industries. She holds an M.A. in creative writing from Brown University and a B.A. from Sarah Lawrence College. Pat O'Neill is Superman, and by that, he means he spends a lot of time naked and talking to himself in phonebooths. He is excited to have his monologue performed here, as well as the opportunity to perform. He was last seen as 'Hannibal Dirch' in a reading of The Maltese Babka, and performing his monologue Funhouse MIrror. His play The Erythrosine Ballad was recently performed at WCT. He would like to thank WCT, Bob, the cast, the crew, his family and friends, and all the people out there stranded on their private beach fighting the tide. Keep swimming back. Jane is an award-winning actor, playwright, screenwriter and essayist. Her work has been performed by the Vermont Actors’ Repertory Theatre at the Brick Box Theatre at the Paramount, by the Daisy Collective at The Cherry Lane Studio Theatre, the Asian American Writers’ Workshop, the TheaterLab, Actors Theater of America and Sid Gold’s Request Room.Her play As I Live and Breathe is the Winner of the 2016 Nor’Eastern Playwriting Contest. Her screenplay Portrait (writer/director/actor) was the Winner of the AAFilmLab's Best Short Scriptwriting Contest. She was one of the creators of the AAFilmLab 72 Hour Shootout Filmmaking Competition. Her WCT stage credits: Tami in Got No Claim by Carol Mark and Mary in The Erythrosine Ballad by Pat O’Neill in The Play Reading Series: July One Acts. Other credits include Hanako in Hanjo at the Bank Street Theater, Sunny in The Last Night of Ballyhoo at The Historic Dock Street Theater and Chorus in Trojan Women at the Hallie Flanagan Studio Theatre. She studied theater and writing at Smith College, the Sorbonne and various programs in New York, including the Labyrinth Theatre and Primary Stages. Jane is proud to be a member of the Shelter Theatre Company and Westchester Collaborative Theater.Jane considers herself a New Yorker by way of Charleston, SC and now lives in Westchester with her husband and two dogs. 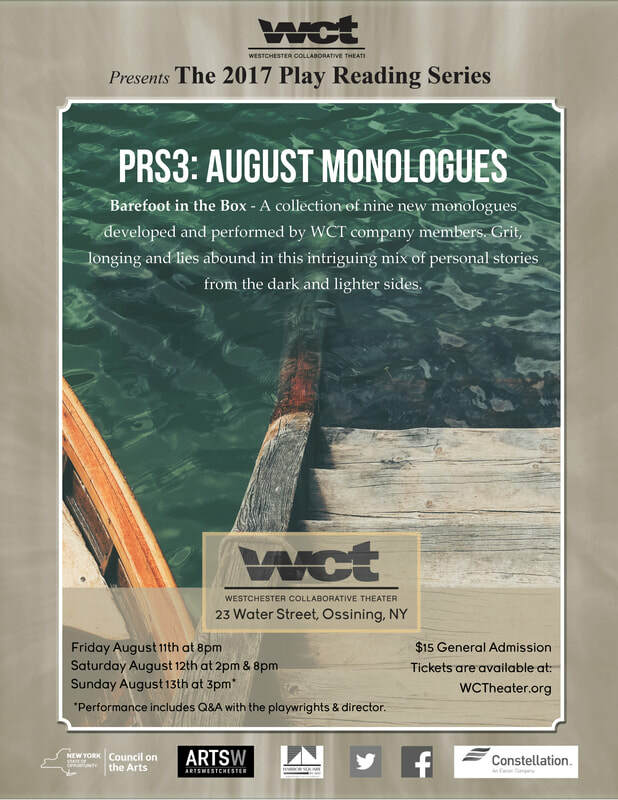 The Play Reading Series: August Monologues marks her playwriting debut at the WCT.